You may have heard the name and you may have wondered what it is. 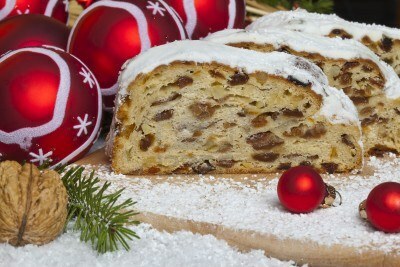 In plain words – it is a traditional Christmas fruitcake. Originated in 1427 , when it was first baked in Saxon Royal Court and it was to represent baby Jesus wrapped in swaddling clothes. The recipe was adjusted and perfected over the centuries – the bread was originally made without butter and was pretty dry and hard. I like to serve it warmed up with butter and sometimes homemade jams for breakfast, but it is great as a snack as well anytime. If you want to know more about this traditional baked goodie, here’s a great article on Wikipedia about Stollen. Add sugar, butter, and salt, and cool to lukewarm. Add 2 whole eggs, and 2 yolks. Add to 3 cups flour and yeast in food processor. Process and let rise until double. Add cardamom, raisins, citron, and cherries, and rest of flour. Process and put on floured board and knead. Let rise in greased bowl. When risen, cut into 3-4 pieces. Roll each into an oval, butter, and fold in half lengthwise. Put on greased baking sheet, cover, and let rise until double. When cool, frost with white butter frosting and decorate with candied cherry halves and sprinkle with icing sugar.